The broader indexes are fake. That’s what irritates me most about them. They’re market cap weighted… a formulation I despise. I don’t think portfolios should be constructed that way. And I don’t believe indexes should either. With market cap weighting, too much power – both good and bad – is given to a handful of the largest companies. And the realities start getting blurred. 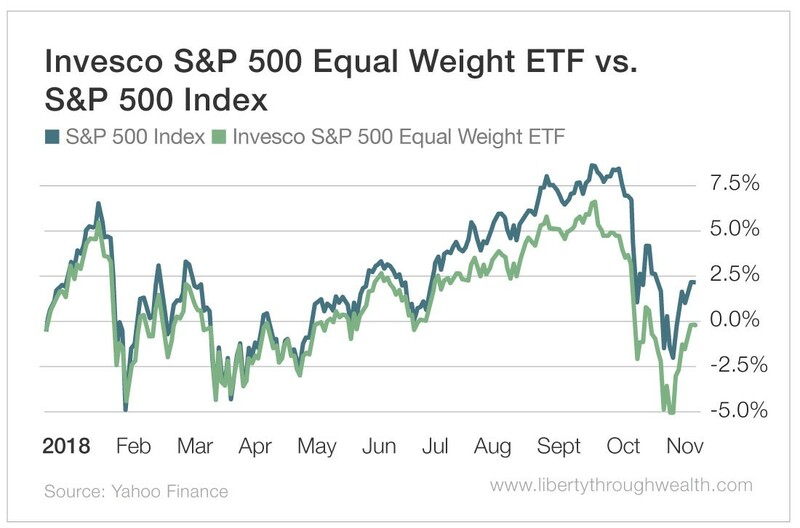 On November 10, the S&P was up almost 2.5% year to date, while the Equal Weight ETF return was negative. That’s because just five companies – 1% of the S&P’s total holdings – accounted for nearly half of all gains and losses on the index in 2018. They’re some of the most heavily weighted components of the S&P, meaning their moves up and down have a pronounced effect on the broader index. Apple is the world’s first $1 trillion company. 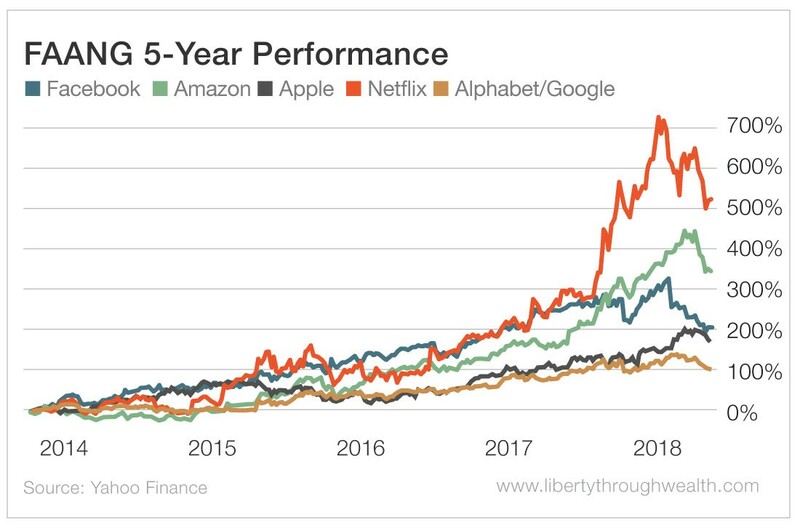 At its peak, Amazon wasn’t that far behind. Facebook and Google are tech giants in their own rights, while Netflix is far and away the world’s largest streaming service. These are the companies that represent the new economy – the digital economy. And for years, FAANG has been a popular investing theme. Again, if most of the market’s gains come from FAANG stocks, it makes sense that owning them will result in market-beating returns. But there’s a fly in the ointment… or maybe a better analogy would be a couple of cavities in the FAANG. We can see that big drop in Facebook shares as second quarter earnings missed. And the company had an enormous data breach that came to light in September 2018. On top of that, Facebook and Google are at the center of the data privacy storm brewing across the globe. Even Apple CEO Tim Cook fired a number of shots at Facebook last year. The most recent was in October, when he lashed out at Google and Facebook for collecting massive amounts of data on their users. Now, I’ll admit, Facebook and Google probably benefited from a divisive midterm election. If you still have a Facebook account, you probably noticed how many political ads were dumped into your feed. But concerns are looming about their long-term prospects. They might continue to be the laggards in FAANG. So there’s a new acronym floating around. 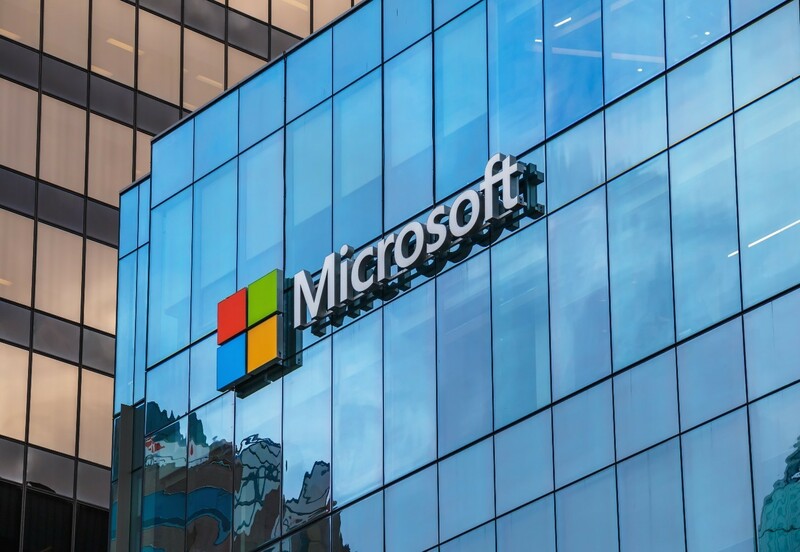 It’s all about dumping Facebook and Google from the mix and replacing them with Microsoft (Nasdaq: MSFT). 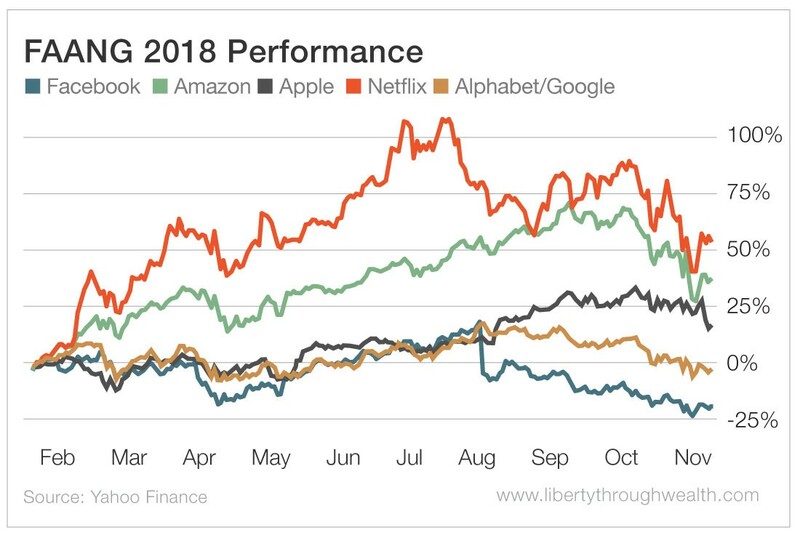 Not only did Microsoft outperform Facebook and Google in 2018, but it performed quite well over the past five years, gaining 185%. That outpaces the return of Google during that span. And that’s all thanks to Microsoft’s nearly 2% dividend yield. 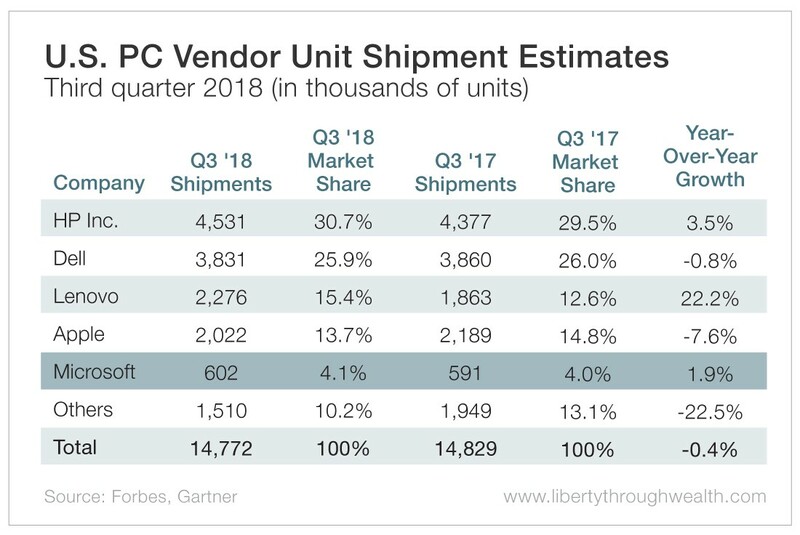 But it shows that Microsoft’s hardware sales are gaining momentum. Almost as soon as FAANG was dubbed, investors began wondering when its reign would come to an end. I don’t think it’s going to be anytime soon for the majority of the group, but Facebook and Google are starting to look vulnerable. Maybe it’s time to pull those two from the group and watch it become a MAAN.